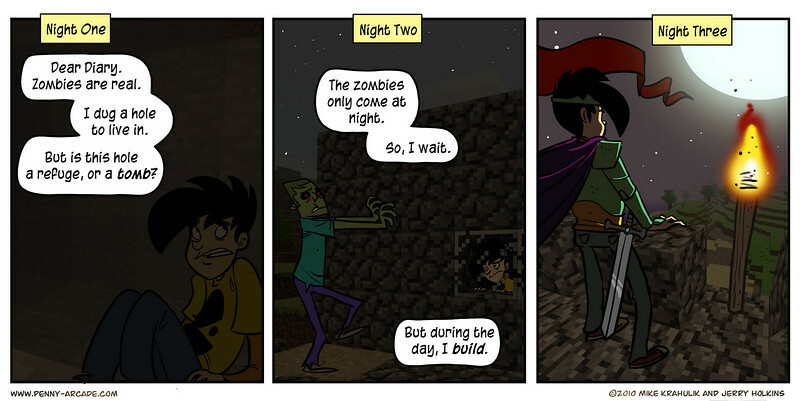 See, after seeing the two comics below, I decided that, damn it, I needed to play this game. Common utterances in the first instance. And then, shortly after making that promise to myself and forgetting about it, Josh Robinson and Jon David Lim over at Bullet Reviews started up a message chain discussing the possibility of starting up a BR server to create our own happy world. Perhaps involving multimedia reviews etched into mountains, block by block. Well, seeing as how the game’s still in the alpha stage, there are some bugs. One such bug is that the multiplayer function is a bit, ah, squirrly. Somehow, this hasn’t stopped people from joining servers and creating cities and a game called Spleef. As near as I can figure, the game involves chasing other people around a board and trying to knock blocks from underneath their feet while keeping yourself from falling. It doesn’t seem that entertaining at first glance, but I can assure you that, if the game is anywhere near as fun as Minecraft itself, then it’s a blast. DISCLAIMER: Aaron is going to go on a mini-tirade about gaming. Way I see it, you’ve got two types of gamers: CoD fanboys, and everyone else. CoD fanboys require heavy-duty graphics and realism. The rest, like me, like happy-looking graphics and pure fun, the sort that makes you feel like a kid again. Minecraft is one of the latter games. It’s what’s termed a ‘sandbox’ game. There’s no goal. You just move around blocks and try to avoid zombies, skeletons, and exploding monsters called Creepers. It is, pure and simple, being a kid again. 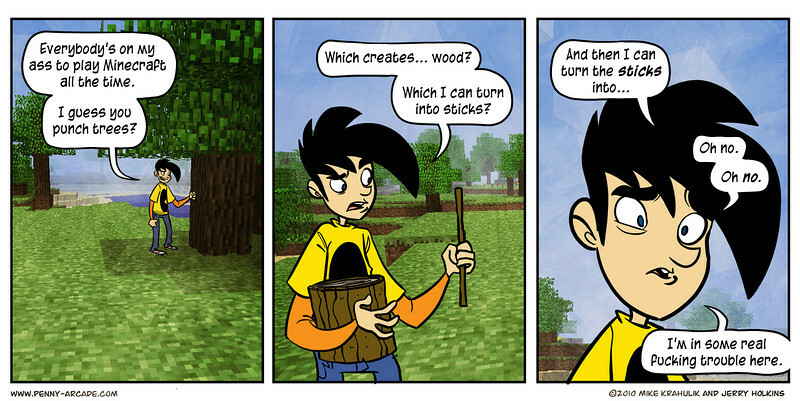 And Spleef, for all the insanity of the name of the game, seems like it carries the torch very well. Anyway, I’d like to reiterate the point I made to Flynn’s friend a while ago: It’s incredibly important to write and not be distracted. But, the thing you won’t hear from writers (myself included, except for this rare instance) is that it’s hard as hell to not be distracted. We’re social creatures, and no matter how many times a person will say otherwise, everyone likes to see shiny things instead of do any work. If I could give her any more advice (which I could – hooray for e-mail), I’d say something along the lines of how the only way to avoid distraction and do some writing is to go somewhere without WiFi (good luck), or intentionally commute on a bus or a train every day and do your writing then. For me right now, distraction takes the form of Minecraft, my brother’s dog, and my nephew-in-law, who loves Halo and has enough energy that, if he were placed in an electricity-generating hamster wheel, he’d outdo cold fusion. And now Starbucks has free WiFi. I’m boned. Minecraft looks aweseome. Spleef also. Especially because it uses the level completion jingle from Kirby’s Dreamland. I fear to ask what category of gamer you’d put me under, but I think I’m okay due to my addictions to N+, the Impossible Game, Castle Crashers and anything Kirby-based. Altho Halo:Reach and Dead Rising 2 have eaten away at my free time lately Distraction is everywhere. It’s worse than germs, or cancer. Most things are carcinogenic; EVERYTHING is a distraction. I got distracted while writing the other day with the options for default font size and colour. Two gains were made out of this: I fully discovered my lethargic and slightly desperate need to avoid anything resembling work, even if I want to do it, and my default font colour is now a mixture of extremely dark red & extremely dark blue, meaning I save on black ink.